J.E.M. ARNOLD is Chief of the Plans Unit of the FAO Forestry Department and JULES JONGMA is a Dutch forest economist. This article is a preview of a position paper to be given at the 8th World Forestry Congress in September 1978 in Djakarta. For the poor in developing countries, both urban as well as rural, wood is usually the principal source of energy for cooking food and for keeping warm. In these countries an estimated 86 percent of all the wood consumed annually is used as fuel. As populations have grown, this dependence has led inexorably to pressures on the wood resource which all too often have resulted both in the destruction of the forest and in a worsening of the situation of the hundreds of millions of people whose life is conditioned by the products of the forest. Available data on wood fuel consumption are based largely on estimates, as the greater part of wood fuel production and usage occurs outside commercial channels and thus goes unrecorded. On the basis of the latest information available and some recent household surveys, the total annual output and use of all wood for fuel in the developing countries is estimated to reach 1200 million m³ (Table 1). This compares with roughly 150 million m³ used annually in developed countries. About half of this wood fuel is used for cooking, about one third for heating the house, boiling water, etc., and the remainder for other domestic purposes, for agricultural processing and for industry. Consumption takes place mainly in the form of fuelwood (firewood), with charcoal accounting for a minor, but apparently substantial, part of the total. Wood fuels account for two thirds of all energy other than human and animal energy used in Africa, for nearly one third in Asia, for one fifth in Latin America, and for 6 percent in the Near East. This compares with the one third of 1 percent of total energy use which wood fuels account for in developed countries. In the rural areas of most developing countries, the dependence on wood and other non-commercial fuels is often almost total. The principal noncommercial fuels other than wood are animal dung and crop residues. It was recently estimated that energy from the use of animal dung as fuel is at present equivalent to around 13 percent of the energy being used in the form of wood fuel, and that energy from crop residues is at a level equivalent to about 16 percent of the energy produced from animal dung (Earl, 1975). In aggregate, wood fuels therefore account for about 85 percent of all non-commercial energy in developing countries, other than human and animal energy. Even in India, a well-developed commercial energy sector and a shortage of wood in most rural areas, wood fuels were estimated to account in 1970/71 for 34 percent of total energy consumption, and all non-commercial organic fuels, including animal dung and crop residues, accounted for 56 percent of total energy (Henderson, 1975), and for 93 percent of rural domestic energy requirements (Revelle, 1976). An impression of the role of wood fuel in rural villages in developing countries is given in Table 2, which reproduces estimated energy budgets, including human and animal energy, for a number of prototypical composite villages in Asia, Africa and Latin America (Makhijani and Poole, 1975). In four of them, energy from wood fuel is equivalent to the total domestic use of energy, and to 65-85 percent of total energy use, including agricultural and processing uses. Only in Bihar in India, where wood is in extremely short supply, and in northern Mexico, where higher incomes permit the use of commercial fuels, does wood not dominate the energy total. Results from a number of surveys of wood consumption in various countries in Africa and southeast Asia are summarized in Table 3. In these countries nearly all wood fuel is used for domestic purposes and for local agricultural processing, and it is the principal fuel for nearly all rural households and about 90 percent of urban households. The pattern of household use of wood fuels differs between urban and rural areas. Though use of fuelwood is generally much lower in towns than in the country, urban use of wood fuels can in aggregate be high, because of the often substantial use of charcoal. Urban use can lead to very large concentrates demands. Use in Bangkok in 1972, for example, amounted to 3 million m³ of wood according to FAO's de Backer and Openshaw. Though of much smaller magnitude than household use, wood fuel for processing and service activities in developing countries is still very substantial, accounting for between 2 and 15 percent of total use in the countries in Africa and Asia where surveys have been carried out. Though some of these uses are dispersed, such as charcoal for commercial food preparation and for ironing, or firewood for brick-making and cement, others give rise to very large demands concentrated in single locations or small areas. For example, tobacco-curing is estimated to have required 1.1 million m³ of fuelwood in Tanzania in 1970 (Openshaw, 1971) and, together with rubber preparation, nearly 300 000 m³ in Thailand in the same year. Demand in such processing uses is now growing much faster than household demand. Source: FAO estimates of wood fuel; UN Statistical Yearbook, 1973. ¹ Fuelwood plus wood for charcoal. ² CE = coal equivalent: assumes one cubic metre of wood is equivalent to 0.33 ton of coal. ³ Total energy excludes organic fuels other than wood, and human energy and animal labor. What the overall shares of firewood and charcoal might be in the total consumption of wood fuel can only be guessed at. Quantitative information about charcoal use, other than on a large scale for industry, is practically confined to such scattered survey results as are summarized in Table 3. These suggest that charcoal is much more heavily used than is usually believed-in Thailand, for example, nearly half of all wood fuel is first transformed into charcoal; also, that its use is rising much faster than that of fuelwood, for a variety of reasons, as we shall see. Domestic energy requirements vary with climate, family size and cooking habits. In general they may be estimated to range from about 1.25 million kilocalories energy input per caput per year (cooking food on an open-fire stove in the warm lowland tropics) to over 6 million kilocalories (cooking and heating in cold upland areas). This would be equivalent to an annual requirement of from about 0.5 m³ to well over 2 m³ of air-dry fuelwood per person. America-average annual consumption of wood fuels per caput is usually close to 1 cubic metre. In the regions where, either through heavy population pressure or a poor natural forest endowment, wood is scarce - China, south Asia, the Near East and north Africa - consumption drops to 0.5 cubic metre and below. The information in Table 3 from consumption surveys in a number of countries illustrates something of the variation within these averages. Given that most of its use does lie outside the monetary economy, it is not surprising that, over most of the range of income prevailing in developing countries, fuelwood use appears relatively insensitive to change in income. An analysis of national per caput averages in 1971 disclosed a slight negative correlation between fuelwood consumption and income growth in Asia, but no discernible correlation in Africa and Latin America. Evidence from within countries is similar. In Thailand, for example, average household consumption of wood fuels in four of the five different income groups was approximately the same, while in the highest income group it was somewhat lower. In Tanzania, there was again no significant difference in average per caput consumption in the income groups covering the poorest 90 percent of the rural population, while in the highest income group it was 10 percent less. In urban areas, the correlation between wood fuel consumption and income is somewhat more pronounced, as more wood is usually sold or bartered. The income elasticity of demand is possibly slightly positive, except for the upper income classes. In monetized fuel markets, where price becomes a paramount factor, wood eventually becomes less competitive because of its low efficiency and high delivery costs. On the other hand, other fuels require investment in stoves before they can be used, which may be an important consideration for low-income households, even if the relative prices of these fuels would later allow lower operating costs. Thus the major obstacle to the substitution of other commercial fuels, even in towns and cities, is quite simply that people are too poor to buy the necessary equipment to use them. When fuelwood is displaced, it is usually first displaced by another wood fuel, charcoal, which has twice the heat value per unit of weight of wood and is more energy efficient in application. Charcoal is in fact in many respects a high-quality fuel and in terms of efficiency of domestic use it may actually be cheaper than fuelwood. Many factors contribute to the preferences in its favour: it is smokeless; its burning characteristics; the flavour it imparts to food; ease of storage; simplicity of charcoal stoves, which make possible the use of the fuel with very little cash outlay. Because between 30 to 50 percent of the heat value of wood is lost during conversion to charcoal, it may be more efficient to use fuelwood where transport distances are short and transport costs low. With its advantage of increased transportability (partly offset by its bulky nature and its susceptibility to losses in handling due to pulverization), charcoal becomes increasingly attractive over longer distances. The balance between fuelwood and charcoal, and the limits of economic supply for the latter, depend on production costs, transport costs and market prices of charcoal and alternative fuels. 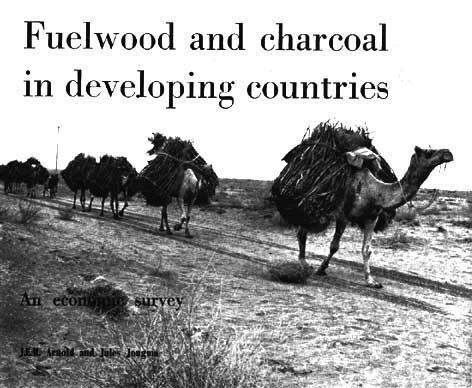 In a recent study in east Africa, it was found that fuelwood was more attractive up to a road distance of 82 km, and charcoal beyond that distance (Earl, 1974). In many areas charcoal supplies are transported over distances of several hundred kilometres and charcoal enters international trade. As most fuelwood which is used is collected for own-use as the need arises, and as collection and transport of wood fuel in rural areas are mainly by human and animal labour, its ply is generally limited to areas within walking distance of the consumer. In a recent survey in India, it was found that villages located inside or adjoining the forest meet their total fuel requirements from the forest (fuelwood and other vegetative ma serial). In areas within 10 km of forest boundaries about 70 percent of the fuel used comes from the forest; beyond 10 km, the use of fuelwood from the forests diminishes steadily until at about 15 km it is almost nil (Mathur, 1975). This type of pattern has been reported from many other areas. Source: adapted from Makhijani and Poole, Energy and Agriculture In the Third World, Ballinger, Cambridge, USA. ¹ All data refer to gross (input) energy. ² Animal dung and crop residues. ³ Transport, crop processing, etc. Although fuelwood for the market moves over considerably greater distances, supply zones still tend to be very limited. Wood is relatively energy-inefficient fuel, compared with other fuels. As fuelwood has a high ratio of weight to calorific output and hence to value, it can seldom absorb the costs of transport over any but short distances. In the savanna region in Nigeria, for example, although fuelwood is transported by road for distances of up to 100 km, a more normal limit on supply distance is less than 50 km. Source: Reports of FAO-assisted surveys In Kenya, Lebanon, Sudan, Tanzania, Thailand and Uganda; unpublished report of ODA survey in Gambia, National Commission on Agriculture, India (see References). It can therefore be wrong to equate wood fuel use exclusively with drain on the forest, and to do so can lead to misleading conclusions in planning future wood fuel supplies Eventually, however, such intense pressures can lead not just to destruction of the forest but to complete removal of all tree and scrub cover In the densely populated Gangetic plain, for example, the forest cover has been reduced to 0.35 percent of the land area in West Bengal and to about 2 percent in Uttar Pradesh. The impact of demand for wood fuel is felt most heavily around centres of population and processing, where demand is concentrated. The use of 3 million m³ of wood for fuel in Bangkok, for example, is felt over a large part of Thailand Even in the Sahel, a sparsely populated region, areas surrounding small and medium centres of population are largely deforested, and around a fishing centre in the Sahel, where the drying of 40 000 metric tons of fish annually requires 130 000 tons of wood, the deforestation extends as far away as 100 km. Moreover, the affected area grows with frightening speed. It is reported from one large town in the Sahel that while until recently nobody used to haul fuelwood more than 50 kilometres, now it is common to go 100 kilometres. Not the least consequence of urban demand is to put a monetary value on fuelwood supplies, so that they become inaccessible to rural populations dependent on subsistence collection. In a recent study in central Java it was found that this was particularly prevalent in the poorest areas, precisely because they offered so few alternative sources of cash income (Wiersum, 1976). There are a number of other consequences of heavy fuelwood use. Where it becomes scarce or costly, the two most frequent substitutes are animal dung and crop residues, which could reduce the production potential of the soil The diversion of dung from use in agriculture is equivalent to burning food in order to cook food. It has been estimated that each ton of cow dung burnt may mean a loss of the order of 50 kg of foodgrain. Although estimates vary widely, total use of cow dung for fuel in parts of Asia, the Near Fast and Africa may be in the order of 400 million tons wet weight. Under conditions of population growth, a cumulative process may be started or accelerated by this diversion of nutrients from crop production. Unless compensated by the application of fertilizer, the use of animal dung as a fuel will lead to lower yields per hectare, which is likely to create additional pressure to bring more land under agricultural crops. Where this can be achieved only by further encroachment on the forest, future domestic energy prospects may worsen and even more dung may have to be diverted to meet energy requirements. As fuelwood becomes scarcer, finding fuel for the household becomes an increasingly arduous burden, which usually bears most heavily on the rural woman. Fuelwood that could be collected in the immediate vicinity of most households a few years ago now has to be gathered and carried from a distance a half-day's walk away. In the process, progressively more rural labour has to be diverted to the supply of fuelwood. Even in conditions of usually widespread rural unemployment, fuelwood gathering could become a significant constraint on other activities in those seasons of the year when agricultural labour is in demand. The shortage of gatherable organic fuel weighs disproportionately heavily on the poorest. If it had to be purchased at prevailing prices, fuel would absorb up to 25 percent in the poorer parts of the Andean sierra and the Sahelian zone. For the poor, the option of substituting commercial fuels as organic fuels disappear is very limited. The most important consequences of growing fuelwood shortages for millions of people is thus the progressive disappearance of the means to cook food and to ensure an essential minimum level of warmth. The question of how to respond to this massive dependence on wood for fuel in developing countries needs to be approached with some caution. Because wood is the predominant fuel at present does not mean that it will necessarily remain the most appropriate fuel. In the course of the five to ten years that it will take for a fuelwood plantation to produce wood of harvestable size, it might be possible to raise incomes in a particular area to the level where kerosene or some other commercial fuel could be used. The resources that would have to be deployed to create the plantation might thus be better employed in this direction. Similarly, the erodable slopes laid bare by fuelwood cutting might better be replanted with an income-generating tree crop than with fuelwood species. The burning of animal dung and crop residues might more appropriately be prevented by use of biogas plants, which convert organic matter to a usable form of energy, methane, and at the same time produce organic fertilizers as a byproduct. However, for the foreseeable future, locally available wood add other organic materials will continue to meet the bulk of the energy requirements of the rural peoples in the developing countries. At the levels of poverty that are all too likely to prevail, the poorer people will be unable to afford anything else. To meet the growing demand for wood fuels, and to limit the negative effects of using the forests for this purpose, a more urgent and widespread attempt is needed to actively meet domestic energy requirements, in particular in areas such as the Sahel, the Gangetic plains, parts of Java, the Andes and possibly regions in China, where shortages of organic fuels already occur or are imminent. In addition to these critical areas, there are many where wood could be the rational choice over other available sources of energy. Its widespread occurrence and its renewability make it suitable for dispersed, remote markets. It can be used, and created, with very little in the way of capital expenditure, with no outlay of foreign exchange and with easily acquired skills. It can make use of land unsuitable for crops and make organic matter available for the production of food. Within the framework of meeting demand for energy with wood fuels, a number of options exist. The first is by using fuelwood more efficiently. The traditional ways of burning wood for cooking and heating are in general not energy efficient. Energy requirements for cooking on open, slow-burning fires have been estimated to be about five times as high as for cooking with a kerosene stove (Makhijani and Poole, 1975). In a study in Indonesia it was found that on the usual types of fuelwood stove 94 percent of the heat value of the wood was wasted. 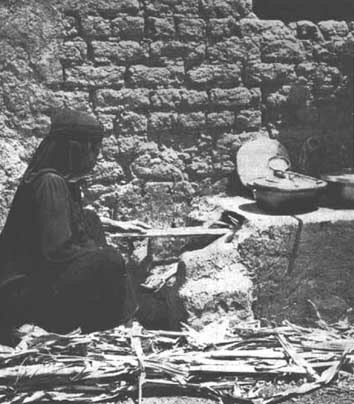 Simple improvements in wood preparation, in stove design and in cooking pot design reduced the consumption of fuelwood for cooking by 70 percent (Singer, 1961). The cash outlay on stove and pot are an evident constraint in achieving such improvements. However, the costs involved are small, and probably smaller than those required to adopt any other fuel. The renewable nature of the forest also offers potential for sustained output of wood for fuel, provided appropriate harvesting and management can be instituted before destruction reaches an irreversible point. Though this can often imply a degree of control which can be difficult to organize and administer, this need not necessarily be so. Efforts of this nature have often been thwarted due to an essentially negative approach to the management and control of pole and fuelwood cutting, which centres on prohibitive legislation. More positive and imaginative approaches are needed. In an area of central India, for example, destructive cutting of the forests was halted and sustained fuelwood production built up, by devising a control system which could be implemented by the local people within the framework of their established tribal customs and practices (Chakravarti, 1976). Another important means of extending the wood-based fuel base is through transforming wood into charcoal. Because charcoal can be transported economically over longer distances, production of wood-based fuel in the form of charcoal can be extended over a much wider area than the production of wood to be burned as fuelwood. Though the properties of charcoal vary with the wood raw material and particular woods have to be used for charcoals for certain special purposes, virtually all woods can be converted into charcoal. Charcoal production can therefore be based on the large volumes of wood of other than commercial timber species which are otherwise destroyed in land clearing for shifting or settled agriculture in the tropics, or which are left unused in tropical forests after logging. In recent studies of what volumes might be available for charcoal manufacture, estimates were arrived at of 100 200 m³/ha in tropical high forest in Surinam, 75 m³/ha in the Terai area in Nepal, 50 m³/ha in Ivory Coast and about 88 m³/ha in the cerrado region of Brazil. While parts of these volumes might equally be used for pulpwood or poles, use as fuel is often likely to be an appropriate outlet. With the steady shift to clear-felling and planting in tropical forestry, charcoal manufacture based on the noncommercial component of the standing volume is coming to be seen as an important tool of forest management. 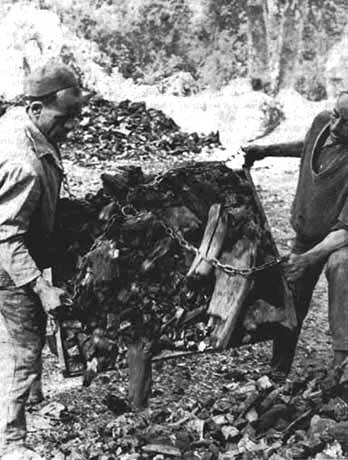 In Uganda, for example, successful introduction of charcoal manufacture from harvesting residues brought about an increase of charcoal production over ten years from 200 to 63 700 tons(Earl, 1975). Uncontrolled working of the forest for charcoal, however, can be as destructive as uncontrolled fuelwood cutting. Charcoal can also be based on plantation-grown wood, but the low conversion factor tends to make charcoal-making unprofitable when the cost of growing the wood has to be taken into account. Plantations can be competitive, however, where they concentrate supplies dose to the market, and so produce an offsetting reduction in transport costs. A feature of charcoal is the ease with which it can be produced. The bulk of the charcoal produced in the world is made in kilns. The simplest earth kilns are simple indeed and require little investment and no specialized skills. A much higher conversion efficiency can be obtained by producing charcoal in retorts. Retorts can also permit gas and distillable by-products to be captured. However, the capital cost of retorts is relatively high, and they require further substantial investment in generating, refining and storage equipment in order to make use of the by-products. As they are best operated on a relatively large scale, retorts are generally used for industrial applications. Considerable attention has recently been directed to the development of such systems as portable retorts, which combine the advantages of kilns and retorts. Wood fuel resources can also be created, or recreated, by growing suitable tree species for the purpose. As the inputs are predominantly land and labour, and time, fuelwood plantations may enable poor rural populations to generate fuel supplies at an acceptably low cash cost. Growing fuelwood may therefore be the most viable solution for populations too poor to afford the cash outlay required for all other fuels - except organic - or for those living in areas too remote to allow economic access to commercial fuels. The success of some self-help schemes to create fuelwood plantations (e.g., in China, India and the Republic of Korea) seems to be largely attributable to success in involving the people concerned. The problems of doing so are not just those of getting people to set aside land and to provide labour, but also to get acceptance of the concept that wood is no longer a "free good" to be gathered from the forest at will. Another factor noticeable in most successful fuelwood plantation schemes is the availability of adequate technical support, in terms both of planting stock and expert advice and assistance. In Korea, for example, where 11 000 villages are establishing new or additional village fuelwood plantations during 1976/77, with labour provided by the villagers, the Government, through a well-staffed extension arm of the forest service which was set up for this purpose, provides the technical expertise needed to select suitable areas for planting, to organize the production and distribution of seedlings and to provide technical advice on establishment and tending. The costs of this supervision, and of seedling, fertilizer and other materials are fully subsidized by the Government. The scarcity of quantitative information about the use of fuelwood and charcoal in developing countries is mostly due to measuring problems: because fuelwood is cut and gathered locally by members of the household that will use it, the whole cycle of use goes largely unrecorded. Very little of it appears in production records. Very little of it passes through commercial channels, or moves through transport systems which maintain records. Therefore, the only way to measure this activity is at the place where fuelwood is consumed. In fact, all the information summarized in Table 3 was obtained through consumption surveys of one sort or another. Such surveys can be carried out only on a light sample basis because consumption is dispersed very widely and thinly. The design of accurate sample surveys can be difficult when, as is the case here, very little is known about the pertinent characteristics of the population to be sampled. Other measurement problems arise from the physical characteristics of fuelwood: it is difficult to measure the volume of stacks of small, irregular pieces of wood; and the relationship between volume and weight, which can be assessed more readily, will vary, open very appreciably, with species, moisture content, etc. Moreover, use tends to vary with the season of the year. An accurate assessment would therefore require continuous of repeated measurements throughout a twelve-month period. This is why the estimates in Table 3, which were extrapolated from measurements taken at one particular time, cannot be expected to be very accurate, as is suggested, for example, by the two sharply differing Tanzanian estimates. The subsidizing of rural fuelwood plantations that is entailed in such provision of technical services is an implicit or explicit recognition that the benefits are likely to extend to more than just the value of the fuelwood itself. Very little work has been done so far on the socio-economic costs and benefits of fuelwood plantations, but such few tentative results as are available suggest that the environmental benefits, and the improvements in agricultural productivity consequent upon better environmental protection, can be substantial, and can contribute to strongly positive benefit: cost relationships. One feature that these results do underline is the sensitivity of the competitiveness of fuelwood plantations to the value of labour. The choice between fuelwood planting and other energy solutions could therefore change quite rapidly over time. The economics of wood fuel production become a little clearer in the case of plantations established to produce fuelwood as a cash crop. Generally speaking, the commercial viability of fuelwood production is highly sensitive to distance from the market, site productivity and the cost of fuelwood from existing forests. A recent study in northern Nigeria, for example, showed that the break-even distance for Neem fuelwood plantations could be three times greater on site quality I than on site quality III, and that on site quality IV the commercial production of fuelwood would not be possible in any location. It was also found that, other costs being equal, if fuelwood from existing forests could be purchased at source for half the stumpage cost of plantation fuelwood, the former would break even with the latter at double the distance, and if it could be obtained free of charge at three times the distance (Ferguson, 1973). Fuelwood production requires careful selection of appropriate species and development of afforestation techniques suited to local conditions. As branches, twigs and virtually all parts of trees except leaves store carbon, and hence energy, the primary criterion for choice of species as a source of energy is production of dry matter per hectare per year. The best fuelwood species may be quite different from the best timber or pole species. Furthermore, a quite different approach to density, spacing and rotation may be needed to maximize production of dry matter. For farm woodlot use, the trees will have to be species that are easily established and managed. In many situations a further important criterion is likely to be joint production of other products with fuelwood (building poles, fodder, oils, fruits, etc.) or the provision of other benefits in addition to wood (shade, shelter, etc.). Wood fuel has been rightly perceived to be "the other energy crisis", which "will probably be longer and more difficult to overcome" than the energy crisis associated with the rise in petroleum costs (Eckholm, 1975). Roughly one third of the world's population depends upon wood for energy. For the very large part of the developing world for which commercial sources of energy are not a viable alternative, the problem of maintaining supplies of sufficient wood or other noncommercial fuel to sustain minimum essential needs assumes an importance at least as great as the problem that the impact of petroleum costs constitutes for that part of the world which can and does use commercial energy. Supplying more wood fuel can be only one of the solutions toward meeting the continuing energy needs of those now dependent upon wood for this purpose. Nevertheless, it is clear that hundreds of millions of people will continue to be so poor that they will have no choice but to derive their household energy from wood and other organic fuels. The potential for expanding the supply of wood fuels is in fact substantial. Wood can be used much more efficiently, existing fuelwood forests can be managed more productively, the supply base can be expanded by first converting wood into charcoal, more fuelwood can be grown or can be produced in conjunction with other crops. The technical knowledge required is available. Though much must be done to adapt it to particular situations, the main information gap is institutional and economic in nature. Much more remains to be known about how much wood fuel is used in different situations. What exactly happens when wood fuel begins to run short? Which of the alternative solutions to the consequent environmental, economic and social problems would be most effective and efficient in a given situation ? How can the people who are affected by all this be best encouraged to adopt this solution, and what help will they need to implement it? ARNOLD, J.E.M., DE BACKER, M.F.E. and PRINGLE, S.L. 1962. Present wood consumption and future requirements in Kenya. Report No. TA 1503. Rome, FAO. DE BACKER, M.F.E., ARNOLD, J.E.M. and PRINGLE S.L. 1962. Present wood consumption and future requirements in Tanzania. Report No. TA 1536. Rome, FAO. DE BACKER, M.F.E. and OPENSHAW, K. 1972. Present and future forest policy goals. A timber trends study, 1970-2000. A report prepared for the Government of Thailand, Report No. TA 3156. Rome, FAO. And, Timber trends study, Thailand: Detailed description of surveys and results, FO:DP/THA/69/017 Project Working Document, Rome, FAO. EARL, D.E. 1975. Forest energy and economic development. Oxford, Clarendon Press. FAO/SIDA. 1975. Bilan de la production et de la consommation des combustibles ligneux en Tunisie. Project working document. FERGUSON I.S. 1973. The economics of plantation forestry in the savanna region. FO:DP/NIR/64/516, Project working document, Samaru, Nigeria, FAO. HENDERSON, P.D. 1975. The energy situation in India. World Bank report, Oxford University Press. GOVERNMENT OF INDIA. 1972. Interim Report of the National Commission on Agriculture on Production Forestry Manmade Forests. New Delhi, Ministry of Agriculture. MAKHIJANI, A. and POOLE, A. 1975. Energy and agriculture in the third world. Cambridge, U.S.A., Ballinger. MATHUR, R.S. 1975. Certain trends in the consumption of wood in India. Indian Forester, January 1975. OPENSHAW, K. 1971. Present consumption and future requirements of wood in Tanzania, FO-SF/TAN 15, Technical Report 3. Rome, FAO. And, Timber trends study: de tailed description of survey and results, 1971, FO-SF/TAN 15, Project working document. Rome, FAO. OPENSHAW, K. 1973. The Gambia: A wood consumption survey and timber trend study, 1973-2000. London, Report to the Overseas Development Administration. PRINGLE, S.L. and ARNOLD, J.E.M. 1960. Present wood consumption and future requirements in Uganda, Report No. TA 1287. Rome, FAO. REVELLE, R. 1976. Energy use in rural India, Science, Vol. 192, 4 june 1976. SAINI, T.S. 1964. Present wood consumption and future requirements in Sudan. Report No. TA 1820, Rome, FAO. SINGER, H. 1961. Improvement of fuelwood cooking stoves and economy in fuelwood consumption. Report No. TA 1315, Rome, FAO. VELTKAMP, J.J. 1963. Present wood consumption and future requirements in Lebanon. Unpublished draft. Rome, FAO. WIERSUM, K.F. 1976. The fuelwood situation in the upper Bengawan Solo river basin. INS/72/006, Project working paper. Rome, FAO.